There comes a time in everyone's life when their friends all start getting engaged and married, as well as having children. This period can last a good few years, and I'm still in the middle of mine. I think it could be a while before it stops! I love attending weddings for friends and family, although having a little one does make it harder to go. Getting an invitation in the post is always exciting, partly just because we don't get much that isn't bills or junk mail! I like it even more when the invite is creative and something that I want to keep. If you want to impress your guests (and avoid chasing RSVPs), try some of my ideas for your invitations. 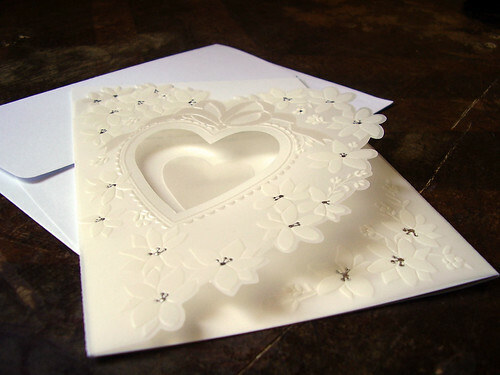 If you google for wedding invitations, a lot of people want to know about the wording. They wonder what the "proper" way of wording their invitations is. But you don't have to stick to any rules. You don't have to put your parents' names on them or stick to a formula. What is important is including all the essential information. Make sure you don't forget important dates, times and locations. Include any info about food, kids, and other matters. If you look for personalised wedding invitations, you can easily use whatever text you want. Invitations are most fun when they can be used as something else. It's great if they look good pinned to the fridge, but you can do more with them. I love foldable invitations that can become something else. It's probably not going to become something practical, but it can be something decorative. Maybe it could fold into a flower or it could turn into a little coin tray. You could just have one that folds to stand up so everyone can place it somewhere prominent. Once you've sent out your invitations, you want to make sure you get replies. With everything you have to do, you don't wish to spend time chasing people up! Include several ways for people to get back to you. Getting replies in the post is a nice thought, but email and phone are quicker and easier. You could even let people reply by text, or using a wedding website. It might not be romantic, but it's practical. Don't stress too much over your invitations. There's a lot more to do, so there's no use getting stressed before you've really started.